Peter Cannon: Thunderbolt is no stranger to the world of comic books. Having first appeared in 1966. Probably most famous for being the inspiration of comic book mastermind and all-around dirtbag Ozymandias from the infamous Watchmen, Thunderbolt hasn’t seeing the light of day for too long. He once stood shoulder to shoulder with the Justice League in DC Comics, but now the character has been relaunched at Dynamite Entertainment and done so in grand fashion. Written by Kieron Gillen (Young Avengers) with art by Caspar Wijngaard (Star Wars: Doctor Aphra), this is one heck of a kick off for not only Peter Cannon but the whole universe he lives is. I say this because we don’t get just to see what Thunderbolt can do, we see a slew of international superheroes rallying behind him. But is Thunderbolt one to unite with, or against? A man gifted with the ability to use 90 percent of his brainpower, Peter Cannon is probably the smartest man alive, which looks to be a gift and a curse. When he is sought for assistance in a massive attack on a city, we see a very cold, calculating “hero,” very reminiscent of Ozymandias. In going against this threat, Cannon reaches a stunning conclusion on who orchestrated such an attack, and that spells trouble to come. Wijngaard’s art looks terrific: clean with an animated vibe to it, and some fantastic character designs. This is easily the coolest redesign Thunderbolt has had in a very long time, and rightfully so for such an iconic character. I loved Gillen’s run on Young Avengers, as well as his book The Wicked + The Divine: Gillen has a gift for writing fresh, fleshed out superheroes. I cannot wait to see what is next for Thunderbolt and the gang. I loved this debut issue: it was easily accessible for those not familiar with the character, yet had enough throwbacks to the character’s history to make longtime fans happy as well. Dynamite looks to have a hit on their hands, one that can end up expanding to a whole new superverse, one I would gladly be on board for. 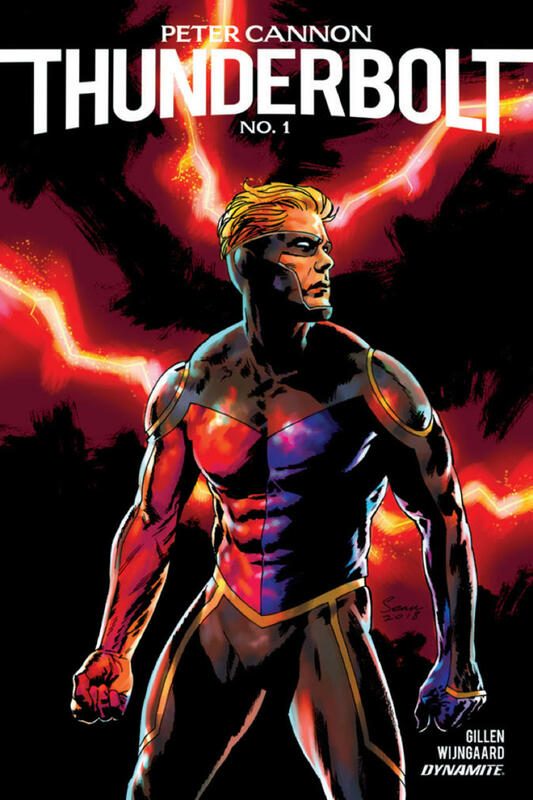 Peter Cannon: Thunderbolt is smart, down to Earth, and poised to make the hero a household name once and for all.